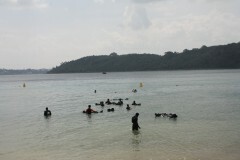 This Try Dive package in the Andamans offers a shore dive with an experienced instructor. You'll be trained in the basic skills for about 15 minutes, and then will walk into the water with the instructor for your Try Dive. 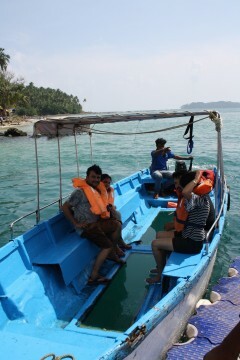 You'll spend 20-25 mins discovering the stunning underwater world and after this, you'll take the boat ride back to Port Blair. NOTE: Photos and videos are included in this package. Do carry a pen drive so you can take them home with you. The Andamans offers clear blue seas and a colourful underwater world to divers from around the world. 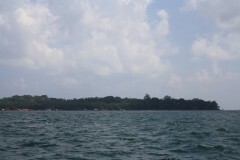 North Bay is one of the most popular locations for visitors to Port Blair, and has gorgeous coral reefs and white beaches to explore. You'll be able to see an array of small fish and vivid corals at shallow depths, which makes it a great location for Try Dives in the Andamans. You'll have to report to Aberdeen Jetty by 08:30 hrs and buy your ferry ticket. 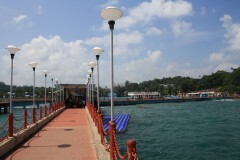 You'll board the ferry from here to North Bay which is a popular site for Try Diving in Andamans. You'll head to the shore for a training session, and then your instructor leads you into the water until you're completely submerged. For the next 25 minutes, you'll swim past colourful coral and darting schools of fish. 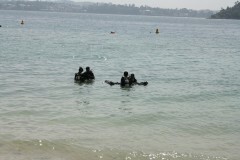 When your Try Dive is over, you'll walk back to the shore and board the ferry back to Aberdeen Jetty. Don't forget to carry a pen drive to collect your photos and videos. Your trip ends here. 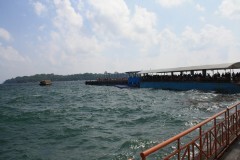 You will have to buy return tickets for the ferry from Port Blair-North Bay-Port Blair.